Cinco de Mayo has yet to hit Europe–when I asked people if they were going out to celebrate they had no idea what I was talking about. One person even said, “The 5th of May, what does that signify? Napoleon’s death?” While Cinco de Mayo does involve the French, really it’s just an excuse for Americans to drink tequila and eat Mexican food. I don’t think they even celebrate this day in Mexico. Anyway, I went to an American friend’s for veggie tacos and we made Palomas. I couldn’t find grapefruit soda anywhere so I substituted sparkling elderflower pear juice (this I found everywhere). The drinks were delicious and much easier than margaritas. Great for the summer! Mexican food in Europe is like Indian food in America: you can find it in the cities, but it confuses people and hasn’t gone mainstream. I know someone trying to get a salsa business off the ground in London and she has the potential to make a killing. 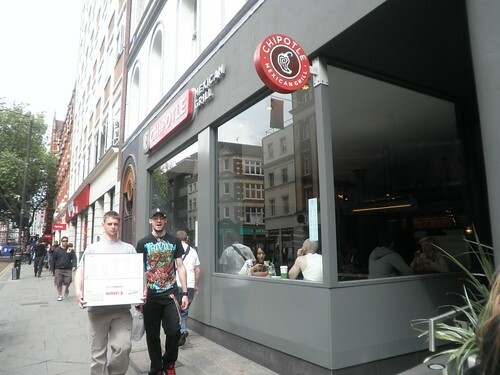 And speaking of Mexican food, my love of guacamole guided me to the only Chipotle in London–I wasn’t even looking for it! The prices are double what you’d pay in New York (like everything here), but I had to get a veggie burrito.